While we live in such a beautiful and peaceful part of the world it’s hard to believe that we need to fit security window screens and doors to our homes. Unfortunately, crime happens everywhere and installing security measures is something we all have to think about. Security Screens Sunshine Coast… It’s peace of mind. There are numerous options available when it comes to security window screens and doors. When going to the effort and expense of adding security to your home there are options to choose from that will suit both your security requirements and your lifestyle. On our Security Screens page, we have provided a comprehensive run down on the options available. 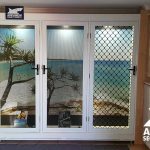 Below we go through the various elements you should consider when it comes to selecting the best security screen options for your Sunshine Coast home. Do you want to install screens on all your windows and doors or just some of them? This is something you need to consider. A house with an open yard may require security on all windows and doors. If you have doors or windows that are concealed but are easily accessible it may be wise to consider installing security screens in these locations. Second storey and high windows may not need security. If you have other security features such as a high fence around your home or security cameras then you may elect to only install screens to the doors and windows accessible from outside the fence line or out of the camera’s vision. Windows and doors that are not commonly left open or used you may consider to not need security. With 3 different styles of security screening available and at differing prices, installing a mixture of screens to your home is something to consider. Each type provides security and each is priced differently. Along with a set budget the look of the security screen, street appeal or having an unimpeded view may be considerations in your product selection. 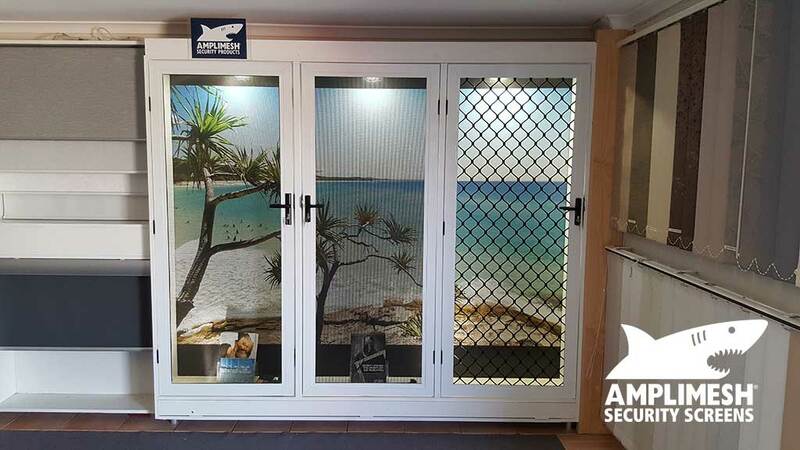 You may choose to install the high quality Amplimesh Supascreen 316 marine grade stainless steel screens and doors at the front of your house, in commonly used areas or where a clear view is important to you. The more affordable Amplimesh Intrudaguard perforated plate is an alternative to both the Supascreen and the traditional diamond grille and, like Supascreen, provides a good view. This product is becoming a popular choice for doors and windows and offers a high security rating. Diamond grille is the most affordable option for security screens and doors. Both Intrudaguard and diamond grille can provide savings while offering security and are often considered in areas of the house where view and appeal are secondary to necessity and budget. As the homeowner, you know your home the best and we can help you evaluate which options will work in each and every situation. Living on the beautiful Sunshine Coast the look of your security screens is an important factor to consider. Don’t just consider how they look on the outside also consider how they will look from the inside. The look of the security screen, street appeal, a fantastic view of the water or hinterland or simply having an unimpeded view of your garden may be key considerations in your final selection. For some, having the visual impact of diamond grille to deter intruders may be more appealing. Both Supascreen stainless steel sheet and Intrudaguard perforated plate come in black only. Although, there is a wide range of frame colour finishes to choose from. Your doors and window screens, in most cases, can be colour matched to your home window and door frames so they will blend in with the overall appeal of your home. Intrudaguard, being a secure product, and providing a clear view is a good alternative to diamond grille. Diamond grille sheets and its door and window frame sections are available in a range of colours to compliment your house. How your home looks will come down to the product you choose. When considering security, the quality and warranty of the product are factors to consider as well as the price. We live in a coastal environment where wet, sandy, salty conditions prevail. Quality concerns such as corrosion and ease of maintenance will certainly come into play. Dealer warranty and local support are also considerations. How long are your security screens likely to last? What guarantees or warranties apply? Amplimesh products, in particular, are well suited to Sunshine Coast conditions. SupaScreen is powder coated high tensile 316 marine grade stainless steel. Amplimesh warrants it for 16 years, the longest warranty of any supplier of stainless steel security products. Strength and durability are key points of Amplimesh quality assurance. Amplimesh IntrudaGuard powder-coated perforated plate is corrosion resistant and well suited to the coastal environment. Amplimesh warranty is 7 years. Amplimesh quality is inherent in the manufacture and assurance. Regardless of your choice, all security window and door screens should be fit for purpose and meet relevant Australian Standards. Maintenance of the security products in accordance with Amplimesh requirements need to be upheld to make sure your warranty on the product is not voided. Specific product warranties, as well as maintenance requirements, can be found on the Amplimesh website. Functionality is another important part of the decision making process. Security window screens and doors need to be up to the job of keeping intruders out of your home. They also need to be designed and installed to work with the elements of your individual needs and lifestyle. Is the security screen going to impact the use of any existing door or window? Do I need sliding screens, hinged screens, fixed screens or a mixture? How will the security screens work in conjunction with the existing door and window spaces within my home? Do I need to consider pet access? While most windows and doors will be fine for a standard security screen installation there will be some situations where a different type of screen may need to be installed. Certain bedrooms may require an escape screen rather than a fixed screen. An existing fly screen servery window where you pass food through may be replaced with a sliding security screen system rather than a fixed screen to maintain functionality. Independent access to both the inside and outside for pets may have high importance. The cost involved in selecting and installing security screens is an important part of your decision making and what you will ultimately choose to install as well as where it is installed. All the above factors come into play and you should consider the pros and cons of each option. Cost, functionality, need, warranty and support are also amongst the factors involved. Installing Amplimesh Supascreen, Intrudaguard or Diamond grille security systems on your house are all options. Whichever option or combination you choose we can help you. Contact Us today to discuss your personalised security screens on the Sunshine Coast.